I have been fortunate to see several such moments in my first nine months as the director of the Academy’s Initiatives, where I coordinate our two environmental programs: Waters of Wisconsin and Climate & Energy. I attribute the regularity of these “a-ha moments” to two key words found in the Academy’s mission statement: The Wisconsin Academy brings people together at the intersection of the sciences, arts, and letters to inspire discovery, illuminate creative work, and foster civil dialogue on important issues. words of our charter—“gathering, sharing, and acting upon knowledge in sciences, arts, and letters for the betterment of the people of Wisconsin.” With this aim in mind, the Initiatives program (formerly called The Wisconsin Idea at the Wisconsin Academy) brings together experts from seemingly disparate backgrounds to explore issues facing Wisconsin’s people, land, and water. These meetings between experts from myriad fields help us to connect dots—and in some cases find previously hidden dots—and move closer to solutions for the most pressing environmental issues affecting Wisconsin today. This past December at the Wisconsin Sustainable Business Council’s annual conference in Milwaukee, I saw a global industry leader actually describe his own a-ha moment. Academy executive director Jane Elder and I were invited by the Council’s executive director Tom Eggert to organize a session on the impacts of climate change on Wisconsin businesses. One of our session panelists, Thomas Myers from Jack Links (a Minong-based firm specializing in beef jerky) stood up and recounted a recent conversation he’d had with Eggert that helped him to connect a series of business-level challenges to the much larger problem of climate change. From 2012 to 2013, our meat costs went up 18%. In the following year, we again saw another substantial increase of 22% in meat costs. Thank you Tom [Eggert]. This is going to be great dialogue back home and to have this conversation with people who think about it a little bit differently—but it is absolutely affecting our industry. And the drought in the Southwest, and actually across America, which drove up the grain prices … drove a lot of the cattle producers to disperse the herds. … The herd reduction has [driven] the supply down. The demand is high, and for a company that consumes [a lot] of the lean beef in the United States—which is us—[this has a] significant impact. So this has really opened my eyes in the last 48 hours, Tom, to thinking about how I can get a better message to our organization, to taking a bigger stand on certain projects that have a bigger impact. Myers’ a-ha moment was proof positive that bringing together experts across disciplines to discuss the intersections between, say, business, agriculture, water, and even beef jerky, can help everyone involved consider a more holistic approach to making decisions that benefit people, planet, and profit. A-ha moments also occur when we introduce new skills to our network of experts. Our Waters of Wisconsin Leadership Network, a group of sixty experts across disciplines and geography, convenes twice each year to discuss the state of water policy and science in Wisconsin, as well as to advise on the future of the Waters of Wisconsin Initiative. This group is the first stop in for anyone across leadership communities in Wisconsin with an interest in collaborating on water strategies. Such was the case at the 2014 Waters of Wisconsin Fall Summit, where we focused on the power of storytelling to enact change in a workshop led by Julie Swanson from Wisconsin Clearinghouse. Swanson’s energy and storytelling skills captivated our limnologists, policy-makers, social scientists, faith leaders, and other experts, setting off a roomful of a-ha moments. Her message about the power of storytelling reminded everyone in the room that, just as Wisconsin’s air, land, and water are relevant to all disciplines, so is narrative and communication. Political movements, conservation initiatives, and even effective testimonies at public hearings all rely on narrative—the way the “big story” is told. Narrative humanizes and simplifies complex subjects and ideas, rendering them intelligible and accessible; it is one of the key strategies we incorporate into our Waters of Wisconsin Initiative as we search for new ideas and more effective ways to communicate the challenges to protecting and preserving our state’s most valuable resource. The power to bring together experts and leaders to synthesize and share new ideas is what has made our Initiatives program so essential to the people of Wisconsin since its inception in 2000 as the Wisconsin Idea at the Wisconsin Academy. Our very first “Initiative”—the first iteration of Waters of Wisconsin— established a foundation for subsequent multi-year investigations of major challenges affecting the state. 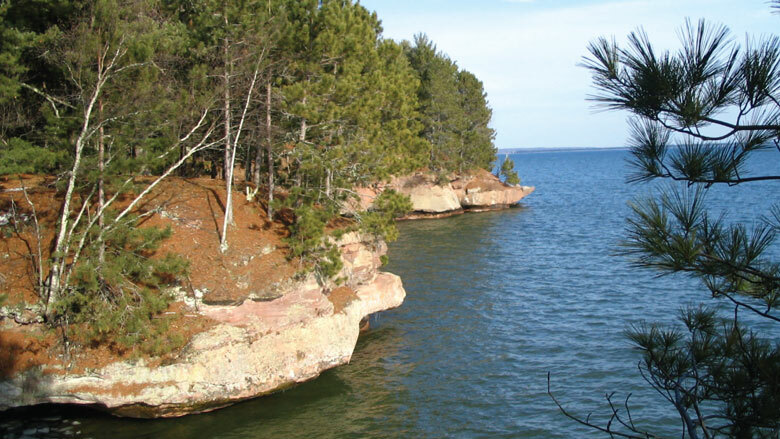 Waters of Wisconsin established a model for civil collaboration by regularly gathering experts in policy, practice, science, and philosophy to examine and analyze the current state and long-term sustainability of Wisconsin’s waters through a process of informed discussion. The culminating Waters of Wisconsin report of 2003 was the product of years of deliberation, research, and analysis from Wisconsin Academy staff, board, and steering committee members. The report’s insights and recommendations remain relevant today, and many of its original authors volunteer as members of our current Leadership Network. Similarly, the Climate & Energy Initiative has focused on practical strategies for cutting fossil fuel emissions that cause climate change. Our 2014 report, Climate Forward: A New Roadmap for Wisconsin’s Climate & Energy Future, provides impressive yet largely unsung examples of Wisconsin business and municipalities that have committed themselves to conservation and sustainability. One of the most practical outcomes of the dot-connecting and multi-disciplinary discovery we do through the Initiatives has been to increase public access to innovative research through our program publications—especially our Climate Forward report (2014) and Communicating About Water toolkit (2015)—and website. You, too, are invited to explore the rich list of resources Initiative staff have generated since 2000 and apply the findings to your own business or community. All of these resources are available to the public for free on our website. Just this year, we created an online portal for our Climate Forward report to help people learn about the Wisconsin cities and businesses setting an example in curbing greenhouse gas emissions and promoting healthy, sustainable communities. We encourage anyone interested in exploring the connections between our energy choices and climate change to explore the Climate Forward web portal and join our conversation by attending our events or connecting with our Waters of Wisconsin and Climate & Energy blogs. You can also help us “shift the cultural narrative on water in Wisconsin” by browsing our Communicating About Water: A Wisconsin Toolkit. If you like what you read, see if you can incorporate some of the communication tips into your own conversations about water, or share the report with local lake associations, watershed groups, and others in your community who want to have a fruitful conversation about water. Today more than ever, the a-ha moments abound in the Wisconsin Academy Initiatives. Won’t you join us and find your own?